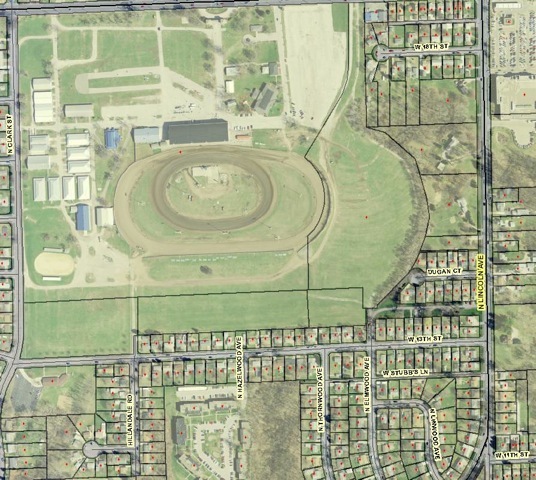 Did you know Davenport was once home to a one-mile dirt speedway? In this issue’s column, you’ll find some information about the track that once existed at what then was called the One Mile Track Club Grounds outside of Davenport and is now the Mississippi Valley Fairgrounds (MVF) in Davenport. I’d heard over the years that a mile track, built originally for horse racing in the 1890s, sat about where the MVF half-mile now sits. And a book, “History of America’s Speedways Past and Present” (1994 America’s Speedways, Comstock Park, Mich.) by Allen E. Brown, briefly mentions the track and says it was “located at the old Scott County Fairgrounds.” It says the track was used for car racing from 1904 to approximately Aug. 16, 1916. 1) The Davenport Mile Track in 1900 hosted an exhibition race between two automobiles, which were a new invention and a rarity at the time. That event likely was the first auto race in Iowa! People from Davenport got to the track’s rural location by train. 2) An actual auto race took place at the Davenport Mile Track as early as 1904, and it was won by nationally famous racer Pete Peterson of Davenport. An advance story about the exhibition race appeared July 13, 1900, in The Davenport Weekly Leader. Baron Von Schaezler and J. Bert Richardson will have a thrilling automobile race at the Mile Track next week. It will be the first race of its kind ever held in Davenport and no doubt considerable interest will be manifested in it. Two automobiles in a race around the Mile Track will certainly be a sight worth seeing. The event will be one of the principal attractions during race week. The race is to be given under the management of the Mile Track Association. Mr. Richardson received word from the Locomobile Company of America, which has its factory located at Bridgeport, Conn., that it has shipped his Locomobile or automobile as it is more generally called. It was expected to arrive in the city yesterday but there is no doubt but that it will make its appearance here before next week. In the years before, the Mile Track had been a favorite for horse racing. But now, in the early 1900s, it was the age of speed and daredeviltry. Racing cars raced airplanes, horses and motorcycles. There were obstacle races — and even stock car races. An excuse was always found for some new kind of race. And talk about speed! Wow! At best, the drivers’ Pope-Toledo racers, or crude cutdown models souped up (could achieve) 60 miles an hour. “We could go 70 on the straight-away; 50 or 52 on the turns. We would average maybe 60 at best,” said Pete Peterson, the ex-Davenport alderman and one of the great old-time automobile racers. Races were held weekend afternoons up to World War I days. They proved to be society events, and the elite of the Tri-Cities were always present in their own autos and fine carriages. Big-time drivers took part in the Davenport track races. Barney Oldfield, a regular visitor here. Barney Oldfield broke the track record at the Mile Track yesterday, making the mile in one minute, one-and-five-tenths seconds. He was trying to better his own all time record of 56 1/2 seconds. For variety, the racers raced airplanes – or anything else that could be dreamed up. “Do Anything” Niles, an area flier, challenged Petersen to a 50-mile race at the Mile Track in 1916. It was an exciting occasion, and 5,000 people were on hand as the plane winged the same circle overhead. Local automobilists took part in the stock car races. One of the early stock car racing fans was a well-known Davenport physician, Dr. A. L. Hageboeck. “The 10-mile stock car event for Tri-City cars was won bv Dr. Hageboeck, who proved himself one of the very best chauffeurs in this section of the country. He surprised his most intimate friends with his daring and skill, speeding his Maxwell around the curves,” The Democrat said. Toward the end of an afternoon of racing, the sign went up announcing the novelty race. Anything happened here. So the next time you head to your favorite local speedway, keep in mind that you’re following a long tradition around these parts.